21. Does Time Really Exist? What Is Time? 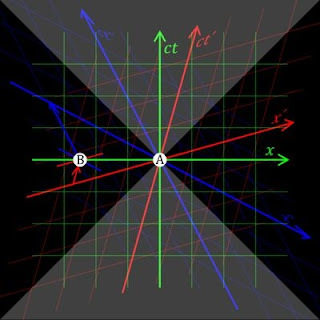 Relativity of simultaneity: Event B is simultaneous with A in the green reference frame, but it occurred before in the blue frame, and occurs later in the red frame (Ref. 1). The original PNG file of the figure was created by Army1987; Acdx converted it to SVG. (GFDL or CC-BY-SA-3.0), via Wikimedia Commons. Aaron: Do we control in time? Or does it control in us? Ted: I do not understand what you exactly mean by the words "control in" in your question. The question sounds like a philosophical one rather than that of physics. But I can say this: Time is one of physical dimensions connected to the Universe or Nature. Therefore, human being can do nothing to affect it. However, "psychological time" (duration of time one feels about a definite length of physical time under different situations) can be controlled by the adjustment of one's mind. Am I talking in the wrong direction than you expected? Aaron: Sorry, I want to know if time really exists. In relativity, time also seems to be relative, right? A body that travels at a speed close to that of light can slow time, right? So, what is time? Ted: I see, Aaron. Time is one of dimensions of the physical framework of the Universe, "spacetime," and is the measure of durations of events and the intervals between them. It has a definite meaning when we consider the movement of something. If there were nothing moving around in the Universe, time would be meaningless and could be said that it does not exist. However, the real Universe includes a lot of moving things. So, time is a meaningful and useful concept. Duration of events and simultaneity depend on the coordinate system (reference frame) on which it is measured (see the figure above), but this does not deny the reality of time. By the way, the slowing-down of the passage of time (time dilation) occurs for the fast-moving body, as you mentioned, but this occurs for the moving system as a whole, i.e., your biological activity and ability also slow down. So, you cannot do much more thing during the high-speed flight in a rocket compared with what you can do on the earth in the same duration of time. You cannot be the master of time but remain to be its slave. It would be another problem to ask if time is a fundamental concept. There is a growing movement to create a theory that shows spacetime is emergent, i.e., not fundamental (see for example Ref. 1). In this respect, time is one of things still mysterious. "Time," Wikipedia: The Free Encyclopedia (February 19, 2013, at 06:41). Graeme Stemp-Morlock, Melting Spacetime, Web site FQXi Community (April 30, 2012). Cover of the first Japanese Naruto manga volume. Aaron: I just wanted to ask you if you have heard about Naruto. Ted: What I think of from the word "Naruto" is tidal whirlpools in the Naruto Strait, Japan. However, this is probably not what you mean. 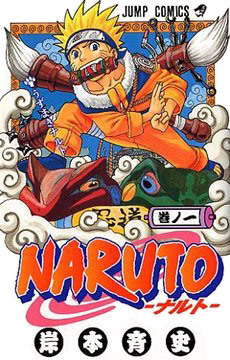 Perhaps, you mean this (though it is not related to the physics of relativity): Naruto (ナルト), an ongoing Japanese manga series written and illustrated by Masashi Kishimoto. I don't know about it. So, I quote a passage from a Wikipedia page (Ref.1): "The plot tells the story of Naruto Uzumaki (note by Ted: Uzumaki means tidal whirlpools), an adolescent ninja who constantly searches for recognition and dreams to become the Hokage, the ninja in his village who is acknowledged as the leader and the strongest of all. The series is based on a one-shot comic by Kishimoto that was published in the August 1997 issue of Akamaru Jump." Aaron: Yes, it's one of the best Japanese anime series. Ninjas can travel near the speed of light. Ted: Oh, Naruto has then a relationship to relativity. Ha-ha! Naruto, Wikipedia: The Free Encyclopedia (January 24, 2013 at 19:01). 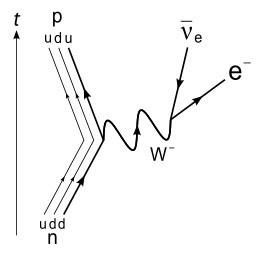 The Feynman diagram for the beta-minus decay of a neutron (n) into a proton (p) , due to the weak force, i.e., via an intermediate heavy W− boson. One of down quarks (d) in the neutron decays into an up quark (u) to make a proton, emitting an electron and an electron anti-neutrino. By Joel Holdsworth (Joelholdsworth) [Public domain], via Wikimedia Commons. Aaron: Do all the forces in nature travel at the same speed as that of light? Ted: There are four known fundamental interactions in nature to cause fundamental forces in the universe: gravitational, electromagnetic, strong nuclear, and weak nuclear interactions. Among these interactions, the mediators of three interactions, i.e., the gluon for the strong interaction, the photon for electromagnetic interaction and the graviton for the gravitational interaction, have (or assumed to have) zero mass. Therefore, the forces based on these interactions are transmitted by the speed of light. The remaining one interaction, weak interaction, is mediated by the heavy W and Z bosons and cannot be transmitted by the speed of light. However, the effective range of the weak force is quite short (around 10−17–10−16; Ref. 1), so that we can regard that the weak force is transmitted almost instantaneously for it actually to work. J. Christman. The Weak Interaction, Physnet (Michigan State University, 2001) p. 2.